A group of 21 students came to an open forum to share personal testimonies and what should be done to reduce gender inequality. The event was hosted in the Student Union Wednesday afternoon by Stefanie Campbell of the Multicultural Student Center. Students from different backgrounds elaborated on their experiences with misogyny from cultural traditions. Many students spoke on how the media depicts gender roles as being a contributor to the mentalities people eventually evolve. A student shared how in coloring books there are specific roles for men and women. 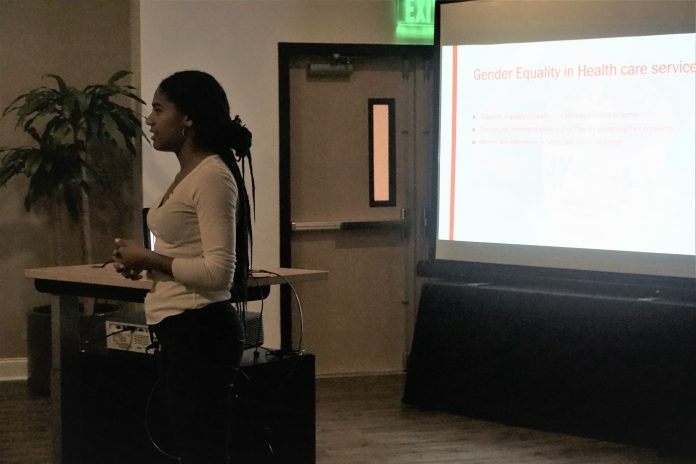 The student shared her example of always seeing women as the nurses and men as the doctors. Michelle Kahn, 20, sophomore accounting major, shared her experience growing up with Pakistani immigrants. Kahn said her parents’ modernizing is owed solely toward their migration from Pakistan. “If I was born there [Pakistan], I probably would have been married and popped two kids out by now,” Kahn said. Kahn said her family has become more modern and have become more accepting of “love” marriages among her kids. Though Kahn shared, her brother had no issue with convincing her parents of who he wanted to marry, unlike her sisters trying to convince her parents. A student who is studying to become a vet technician shared how women dominate her field. When the clinic she works for got a new doctor who was male, she said she witnessed how uncomfortable the female staff had got initially. Students of diverse background shared how culture played a huge role in their perception of their role at home based off their gender. “I grew up in a very traditional Latino household,” said Ashley Perez, 22, graduate student in social work. “A lot of the personal experiences resonated with me and validated my experience that as women we might be used by gaslighting [questioning one’s judgement] and there might be more to it. But sometimes it [maltreatment or rejection] is just being pigeon-hold in [assign to a group or class in an exclusive manner] due to your gender. A male student shared how he was discouraged from doing household chores because “it won’t be necessary” and was encouraged to focus on outdoor work.